The tribes have assembled and the war drums are banging. Warrior training, and the synchronization of pain, has commenced through this great nation and the time is dripping away until the Violence of the Fall is again unleashed upon the populace. The great sacrament has begun: another NFL football season is underway. NFL training camp is in full force this week. That means we are just weeks away from the ritualized bloodshed that consumes our weekends and national consciousness from September through to February. Right now is the most hopeful time of the year in football circles and at the moment there are 32 organizations trying to convince themselves that this is their Year, their Time for success, riches, fame and immortality. But we have a long way to go before we can get into that kind of talk. In the meantime, I thought I’d break out a little 2010 NFL Preseason Power Rankings. I’m not trying to grade teams on their offseason. And I’m not trying to project where teams are going to be three months from now. Instead, these NFL Power Rankings are simply a snapshot of where I see the league at the moment as well as some notes as to what I’m looking at as their begin The March. 1. New Orleans Saints – You’ve gotta beat the champs to be the champs. As always, the Super Bowl champs had some players picked off their roster, although the Saints didn’t lose anything that they can’t compensate for. I don’t think that they will be as dominant this year and I think they may struggle with the AFC North this season. But with Drew Brees and that offense they should be back in the postseason again. Four of their last six games are on the road and they open with a rough, rough slate. So don’t expect things to be ultra smooth for this group. However, until someone proves that they can consistently stop this attack the defending champions get the No. 1 slot. 2. Baltimore Ravens – I really like what the Ravens have built and I love the type of football that they play. But I do have some concerns here. I actually don’t think that John Harbaugh is a very good coach. And I think that showed time and time again last year as the Ravens struggled with their discipline, especially late in games. This is still Ray Lewis’ team. But he’s lost two steps, and if he get hurt and/or if Ed Reed doesn’t come all the way back from his hip surgery (he’s starting the year on the PUP list) then this defense will get even shakier than it was, at times, last year when it gave up 23 or more points six times (third-highest total since 1998). 3. 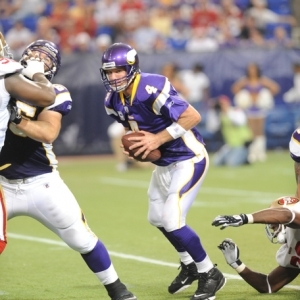 Minnesota Vikings – Obviously I’m assuming that Brett Favre is coming back. I think that there is could be a regression out of the Vikings this year. They simply won’t be able to bottle the magic that they had in 2009. But the Vikes should actually be better because they have another year of experience together. Neither the defense nor the offensive lines lost anything, so this team will be back in business. Of course, for the third straight year Kevin and Pat Williams face the prospect of a four-game banned substance suspension. If the Vikes lose that duo they are in trouble. But if everyone plays then this team is following the natural progression – make the playoffs, make a playoff run, go to the Super Bowl – that most championship teams have endured lately. 4. Dallas Cowboys – It’s now or never for the Cowboys. The rest of the NFC East is as suspect as it has been in a decade while the Cowboys are standing pat after their second division title in three years. Dallas may even be better now that they have dumped Flozell Adams and added Alex Barron and Dez Bryant. Dallas will never win a championship as long as Wade Phillips is the coach. But I think this could be the best team that they’ve had this decade and they will make a run…until Wade blows it again. 5. Indianapolis Colts – All they do is win. And Peyton Manning is a mutant, so you can’t bet against them. But I’m not high on the Colts at all. I don’t think that they are immune to the Curse of the Super Bowl loser. I really thought they overachieved last year, winning seven games that were decided by four points or less. That’s all Manning. They were just No. 9 in offense and No. 18 in defense, and the team benefited from one of the weakest schedules in the league (they played the NFC West and AFC East). But just like the Angels in baseball and the Spurs in basketball, it’s nearly impossible to bet against Manning and the Colts. 6. Green Bay Packers – The Green Bay offense is just devastating and should be even better (they were No. 3 in scoring and No. 6 in total offense last year) this season now that they have some more talent and stability on the offensive line. But Green Bay’s defense won’t be in the Top 5 again this year. They lost two of their best run stuffers, Aaron Kampman and John Jolly, and I think that teams will have more success against the Pack’s 3-4 this year. Green Bay has posted significant flops in the past – winning 13 games in 2007 then falling to a six-win 2008, for instance – this team still has the pieces to be an NFC player, despite a brutal schedule. 7. San Diego Chargers – The window for a title in San Diego is closed. And the only people that don’t realize that are the Chargers. Sure, they will stay in the AFC mix. But that’s only because the other three organizations in the AFC West are like kids with no arms and no legs trying to play basketball. Ron Rivera will keep the defense tight and Phil Rivers will score points. But there isn’t any sizzle to this team and they have simply lost too much talent over the last three years to be considered elite. Oh, yeah, and there’s the fact that they have Norv Turner as their coach. 8. New York Jets – I’m not as high on the Jets as a lot of people are, but will give them Top 10 credit. The reason is that their defense is probably the best in football and it’s only getting better with the additions they made in free agency and the NFL Draft. However, they brought in a bunch of low-character guys and mercenaries. And we’ve seen stunts like that not pan out before. If Indianapolis didn’t rest its starters last year then the Jets would have missed the playoffs and no one would be talking about them as Super Bowl contenders right now. They have a vicious schedule and a big bull’s eye on their backs. High expectations and New York City don’t usually end well for sports teams. 9. New England Patriots – This is a quarterback’s league and a when you have one of the best QBs and best coaches then you’ll have a chance to have some success. But I think that sneaking in the Top 10 might be the ceiling with this team unless some guys make some incredible strides on the defensive side of the ball. They are awful in their back seven and they didn’t really do anything to upgrade. If they can’t stand up better against the run, especially with the Jets (No. 1 rushing team), Dolphins (No. 4), Ravens (No. 5), Bengals (No. 9) and Vikings (No. 13) on the schedule in their first seven games, then the Patriots won’t be any better than last year’s 10-win group. Hey, which is great for a lot of teams in the NFL. But when you’re used to championships it’s not acceptable. 10. Arizona Cardinals – I think that the Cardinals might be the most underrated team in football heading into this season. I may be one of the few people that aren’t worried about Matt Leinart. He has talent and he’s been able to sit back and learn from one of the best ever in Kurt Warner. He still has ample weapons in the passing game, an offensive line that added a Pro Bowler in Alan Faneca, and a running game that is going to be stellar this year. Also, Kerry Rhodes was an excellent addition to the pass defense. Ken Whisenhunt and Russ Grimm have formed this organization into the mold of the Pittsburgh Steelers. That’s a great system to follow and I think that the Cards are still the frontrunners in the West. 11. San Francisco 49ers – I know that the Niners are becoming The Trendy Team. And Trendy Team always, always, always falls on its face when the pads start banging. But it’s tough not to like this group. Their defense is much, much better than the No. 15 ranking they earned last year, mainly because they received zero help from the offense. That should change with a full preseason with Michael Crabtree, more girth on the offensive line and in the running game, and another season overall in Jim Raye’s offensive system. The Niners have seen their win totals escalate from five in 2007 to seven in 2008 to eight last year. They are a threat in the West. 12. Philadelphia Eagles – Until I see reason to do otherwise, I’m not going to doubt Andy Reid. All this guy does is win and put excellent football teams on the field. Again, it’s The System. That’s why the Colts, the Patriots, the Ravens, the Eagles and the Steelers have dominated the past decade. So I’ll trust The System…for now. This team trimmed a lot of fat. Whether or not that’s good for them in the short term remains to be seen. But, again, they have made the playoffs in eight of 10 years, have averaged nine wins per year over the last five seasons, and have finished below .500 just one time since 1999. 13. Miami Dolphins – This is a team that I’m pretty high on this season. I liked what I saw from Chad Henne last season and, you know, there’s just something about Michigan quarterbacks that they find a way to win. The Fins run the ball, they play physical defense, and they have an “under the radar” quality that I like. They are matched up with the NFC North and the AFC North in crossover games this year. That’s a lot of head bashing and it will make it difficult for the Fins to hold up over 16 games. Their depth will be tested. 14. Pittsburgh Steelers – Man, what a mess, eh? Bad karma abounds around this team and missing Big Ben for at least four games to start the year is a killer. But Pittsburgh isn’t as weak as most people are peddling them as. They went 9-7 last year in a very difficult division while having to face a Super Bowl champion’s schedule. And not a single one of their losses last year was by more than a touchdown. Their rushing attack will improve and their defense will be back to elite once Troy Polamalu – remember, he only played five games last year – is back to 100 percent. Don’t sleep on the Steelers, bad karma and all. 15. Cincinnati Bengals – I’m proud of Cincinnati. I was one of the only prognosticators in the country last year that predicted a stellar season for the Bengals. They delivered. But now there is always the possibility that they could revert to their Bungle roots. They were 6-3 in games decided by a touchdown or less, which is amazing considering that Marvin Lewis was at the helm. But between some tragic deaths, some lucky bounces and some weak competition late in the season, this team played with some magic. I don’t know if it will carry over. They will still run the ball and still enter the season with an exceptional defense. But the problem with the offense isn’t something that Terrell Owens can fix. That is, unless he can play on the offensive line. 16. Atlanta Falcons – The Falcons could be set up perfectly for the NFC South Bounceback. Their defense was torn up by injuries last year and most of the luck from their 11-win 2008 season evaporated. But Mike Smith is another guy that’s building a tough, physical franchise here and those teams are in the hunt more often than not. I’m a big Matt Ryan fan and I think he’ll continue his ascension. However, their schedule is awful. Four of their first six games are on the road and five of those games are against teams that were .500 or better last year. Later they have a stretch where they play four of five games on the road, in late November and early December. Even though those games are against the weakest teams in the league that’s still tough to do. 17. New York Giants – I always have a really, really hard time predicting what the G-Men are going to do. And looking at their soft early schedule I’m certain that this team will be in the Top 10 in my Power Rankings through all of October. But the Giants do have some issues. Neither their running game nor their defense is anywhere near where it was in 2007 and 2008. And as I look at their back seven all I see are question marks. There are good pieces and Tom Coughlin is a proven commodity. But I don’t see much cohesion, I don’t see a lot of hunger, and I don’t see the top-end talent that I think you need to hold up for a full season in the NFC East. 18. Houston Texans – I know, I know: watch out for Houston this year. I’ve been hearing that for about four years now. But Houston does the same thing every year: they get loaded up with expectations, they come out and play soft, undisciplined football for about 10 weeks, then they rally in December and rip off an “where’s that been” winning streak. They’ve gone 12-4 in their last four games of the season over the last four years. But they are 19-29 in the rest of their games. Matt Schaub finally stayed healthy, but can you count on that again? And what upgrades have they made on a defense that has finished inside the Top 20 just one time (last year they were No. 13) in the last seven years? I’m not buying. Not until December, anyway. 19. Washington Redskins – I would love to have the Redskins placed higher than this. I really would. And if they were still running a 4-3 defense, with Al Haynesworth and perennially underrated Maake Kemoeatu in the middle, I would have them in the Top 15 or maybe even Top 12. Donovan McNabb is going to make a world of difference. But Washington’s season will be defined by two things: how the offensive line takes to Mike Shanahan’s blocking schemes, and now the defense adjusts to a 3-4. The talent is definitely there for this team, on both sides of the ball. And for the first time in about 10 years they finally have a coach that could possibly get something out of it. 20. Tennessee Titans – I hate having a Jeff Fisher team this low. Especially one that was the No. 1 seed in the AFC just about 18 months ago. Injuries in the secondary were at the core of their problems last year. That, a rough schedule, and a loss of the magic they had in 2008 when they dominated the fourth quarter and were 4-0 in games decided by a touchdown or less. Fisher has only finished below .500 three times in the last 14 years. And despite a challenging schedule it is hard to bet against this group this year. Expect a nice move up the ranks for the Titans. 21. Chicago Bears – This is a team that could play its way out of the 20s. But they still aren’t very good. Unless Julius Peppers put on about 50 pounds and moves to defensive tackle, or loses 70 pounds and moves into the secondary, he wasn’t what the Bears need. And who the hell is still hiring Mike Martz? Hasn’t that guy proven in the last 10 years that his system doesn’t work? Chicago’s offensive line is still a glaring weakness and they don’t have any elite skill people. Add in a goofy schedule, with a trip to Toronto and three short weeks due to primetime games, along with a lame duck coach and Chicago’s going to be nothing but drama all year long. 22. Jacksonville Jaguars – Well, at least Jack Del Rio will be leaving a good young nucleus in the cupboard for his replacement. This is not the team, nor the division, that you want to be taking into a make-or-break season. Twelve of Jacksonville’s 22 starters have three years or less experience in the NFL and, according to a “functional age” ranking they have the second-youngest team in the league. Not good. Even if they get off to a decent start, they close with four of six on the road. That sounds like a death rattle to Del Rio’s head coaching tenure to me. 23. Carolina Panthers – John Fox is another guy that I love as a coach. But he just doesn’t have a ton to work with. He’ll be better off without Jake Delhomme and without the loafing attitude of Julius Peppers. They are still one of the best rushing teams in the league so they will be in most games. And despite shaky quarterback play and an underrated division the Panthers haven’t dipped below 7-9 since 2001 and they’ve averaged nine wins per season the last five years. This is a team I can see making a quick rise from this ranking. 24. Oakland Raiders – Yeah, I know, this is probably way too high for a franchise that has averaged a 4-12 record for the last five seasons and haven’t won more than five games in the last seven years. But hear me out. You can’t completely quantify how bad JaMarcus Russell was and what a drag he was on offense and defense. He’s gone. Finally. And as I watch how this team is being built I see shades of what is going on in San Francisco, Miami, Arizona, and some other places where losing has been an epidemic in the last decade. The Raiders are getting more physical, building from the trenches, and taking on kind of a mean streak. They were competitive the last two months of the year and that could carry over. Six wins would be like winning the Super Bowl. I think they threaten seven. 25. Denver Broncos – Yeah, the Broncos are a mess. I know that they were “just that close” to making the playoffs each of the last two years (an epic collapse in 2008 and a wasted 6-0 (and 8-4) start in 2009) but I think that this train is headed in the wrong direction. Josh McDaniels is a clown. And although the aging secondary is still one of the best in the league, the front seven is among the league’s softest. They’ve simply lost a lot more talent than they’ve picked up over the last two years. And between the Jets, Chiefs, Browns and now Broncos there just aren’t enough ex-Patriots players to go around. 26. Kansas City Chiefs – I keep thinking that the Chiefs are just a step or two away from being a surprise team in this division. But then there are just too many games where they are completely overmatched and they are just getting blown off both sides of the ball. The last three years their point differential to the rest of the league was -109, -149 and -130. That’s pretty pathetic and is actually in the same neighborhood as the equally pathetic Raiders. They have some pieces I like, but until they get serious on the offensive and defensive lines (they have two of the worst units in the NFL) they’ll remain a bottom-tier team. 27. Seattle Seahawks – I completely understand why the Seahawks brought in Pete Carroll. I mean, given the stellar track record of recent college coaches making a jump to the pro level – be it in the NBA or NFL – I think everything is going to work out well for Carroll. Between his babbling and his habit at USC of losing games to clearly inferior competition, I’m sure he’ll be great. Injuries definitely rocked this team last year. But when I look at the roster I see a mish-mash of players. And with new systems on both sides of the ball and a widening gap between the vets and the younger starters I don’t see things being very sunny in the Northwest. 28. Detroit Lions – That I even have this team at No. 28 is a monumental step. And the only reason I’m going there is because they seem to be on the right path, adopting a more physical mentality. But I’m not sold on Matt Stafford and their defensive back seven is still one of the worst in football. The reality is that they have been outscored by a total of 481 points in their last two seasons. That’s an average loss by 15 points every week and that’s a whole lot of ground to cover. They’re not close yet. But they are improving. 29. Tampa Bay Buccaneers – This team is dicey and dangerous. They fluked wins against Green Bay and New Orleans last year. But they also got bombed by 13 or more points seven times and by 20 or more points four times. Raheem Morris isn’t ready for primetime. And this inexperienced, overmatched coach is surrounded by inexperienced, overmatched players. Twelve of their 22 starters will likely be players with three years or less experience, including a second-year quarterback that was erratic, to say the least, last year. Tampa Bay was in the bottom five in total offense and defense and scoring offense and defense. And what they added isn’t even close to what they lost, in terms of ability. But hey, weird things happen in the NFC South. 30. Buffalo Bills – What a disaster this franchise is. They just continue to make one idiotic decision after another. Let me end the suspense: Chan Gailey is going to be a debacle. And maybe no one wanted to take the job, but I still believe they could have found someone better. They have terrible skill position players, had another weak draft, are shackled with an atrocious offensive line, and own a defense full of players made of glass. Things aren’t good in Buffalo. There will be no strides made this year. Go ahead and pencil them in for an overachieving 5-11. At best. 31. Cleveland Browns – At the end of last season the Browns had the worst collection of skill position players that I’ve seen in the last 15 years. It was horrendous. But they reloaded by adding Jake Delhomme, Peyton Hillis and Ben Watson, and if you couldn’t pick up the sarcasm it was pretty thick. The Browns are rebuilding but there really doesn’t seem to be a cohesive plan toward anything. They could start a pair of rookies in the secondary and Eric Mangini still has a long, long, long way to go before proving that he can coach. Mike Holmgren will get these guys going in the right direction. But not this year. They haven’t hit rock bottom yet. 32. St. Louis Rams – So how do you turn around a team that was outscored by an average, an AVERAGE, of 16 points per game last year? If your answer was a rookie quarterback behind a rebuilt offensive line, you were incorrect. Well, that is, unless you’re St. Louis brass. This franchise is a total disaster. And over the last three years they, not the Lions, have been the worst team in football, being outscored by 669 points (14 per game) over the last three campaigns. And it seems like they are tearing down the roster even further, going with young, cheaper, more uncertain players. Their wins have dropped from three to two to one over the last three years, and I think that this could be the worst group yet. Robert Ferringo is a writer and a professional NFL and college football handicapper for Doc’s Sports. Last year he brought home +62.5 Units for his clients for NFL picks and he is regarded as one of the top totals players in the sport. He guarantees a winning football season this year or he will work for free until you turn a profit. You can sign up for his college football and NFL picks and get more information here.